Offer condition: Discount code applies only to products within Nightwear Gifts Collection. Limited by stock and availability. Offer condition: Discount code applies only to products within Provocative collection. Limited by stock and availability. Do not miss another Bluebella voucher! Simply leave your e-mail address and we'll always keep you informed of new vouchers for Bluebella. Offer condition: Mother's Day Promotion 20% off full priced nightwear only. Limited by time and stock. Offer condition: Nightwear promotion code applies only to fully priced products. Limited by time and stock. Offer condition: 20% off with the code for Valentines Day. Available for Lingerie and Nightwear. Offer condition: The discount sale applies only to the Sale collection. Limited by stock and availability. Offer condition: Limited by stock and time. Code applies to Nightwear gifts collection only. Offer condition: Limited by time and stock. Code applies to Lingerie Gifts collection only. Offer condition: The discount code applies only to the nighweat gifts collection. Limited by stock and availability. Offer condition: The code applies only to Lingerie Gift section. Limited by stock and availability. Singles Day 10% discount on all products across the website with no minimum spend! Offer condition: Singles Day 10% off all Bluebella products with no minimum spend. Limited by stock and time. Up to 70% discount on selected products with extra 10% discount on top of the promotion! Offer condition: Halloween Flash Sale applies to selected items, limited by time and stock! 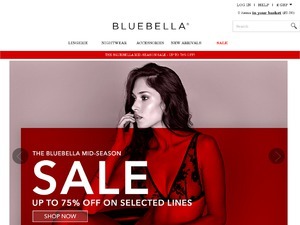 Offer condition: The discount code will only apply to Sale section of Bluebella website as long the stock lasts. The offer is valid for 48 hours only. Offer condition: Free delivery to United Kingdom only with code BBFREEUK, 1 use per customer. Applies to Standard Delivery only. Offer condition: Spend £60 for free Tilly Gifting Knickers Ivory with code – BBTILLY. Limited by stock. The Tilly Gifting Knickers Ivory has to be added to the basket and will not be added to the total of the basket towards the promotion threshold. Offer condition: Buy Marina Bra in Ivory only and use code for 30% off Marina Thong in Ivory only. Offer condition: Use code BBOUTLET in outlet section only. Offer condition: Spend £60 to get free Body Bow Ivory for free with code BBBRIDAL. The code will only apply to Bridal Collection on Bluebella website. Please remember to add Body Bow Ivory to the basket for promotion to apply. Body Bow will not account to total of the basket. Spend £60 for 50% discount on Jinx Body Bow. Offer condition: Spend £60 and use code BBJINX for 50% off Jinx Body Bow Dress. Please remember to add the product to your basket. Jinx Bod Bow Dress doesn't count into the total of your basket. Use code BBGIFTNIGHT for 20% discount on fully priced Bluebella Nightwear products. Offer condition: Use the code for 20% off, applies only to full priced items in Nightwear collection.